Effective governance and accountability of the security sector in conflict/post-conflict settings is needed to prevent security sector actors from misusing their powers, political authorities from misusing their control over the security sector actors, and most importantly, to enhance public confidence and (re‑)establish legitimacy in the sector (UNODC, 2011). For this to occur, security sector actors must accept that their decisions and actions might be questioned, and that any misconduct could lead to consequences such as sanctions or compensation for the victims. Without such accountability and transparency, corruption and other forms of misconduct may thrive (UNODC, 2011). Internal governance and control (involving military police, disciplinary committees, behaviour/conduct units, human resources, military tribunals) including staff supervision and performance monitoring, as well as disciplinary systems for reporting, responding and tracking complaints of abuses by police, military and other security personnel. Executive control (involving head of state, ministries of defense and interior, national security advisory and co-ordinating bodies) through measures that demonstrate high-level commitment to the issue. Oversight by independent bodies (e.g. ombudpersons offices, national human rights institutions, independent review boards, audit offices, public complaints commissions). Civil society oversight of the sector (involving think tanks, non-governmental/ civil society organizations, women’s groups, media). 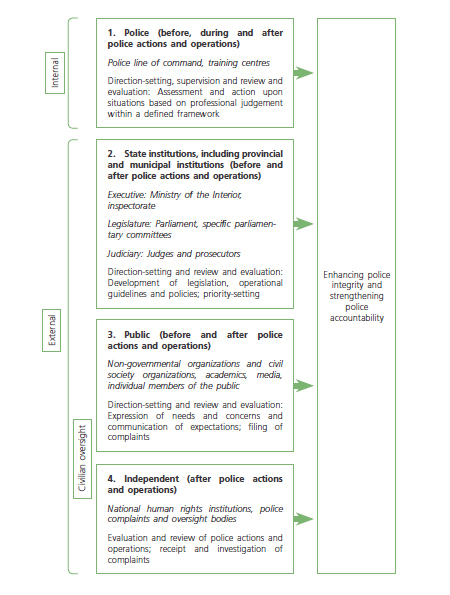 As demonstrated in the chart below, using the police as an example, various actors share responsibilities for oversight at different stages of police actions and operations and may complement each other or overlap. Not all mechanisms will be in place in every country at once. Source: UNODC. 2011. Handbook on police accountability, oversight and integrity, pg. 18. UN: New York. Available in English. Ensuring the full participation of women’s organizations in both internal and external mechanisms will provide a better opportunity to address gender issues, and can make these mechanisms more participatory and comprehensive (Barnes and Albrecht, 2008). Keeping the public informed about the conduct and misconduct of security sector actors can increase their faith in the police and assist women in identifying whether and where it is safe to report to police. Example: Accountability and oversight in Haiti. Source: excerpted from UNODC and United States Institute of Peace, 2011, p. 77. In a conflict/post-conflict setting it is equally important to ensure that security sector reforms – and the impact of police performance – are measured systematically. While this can be a challenging task some tools are available, one of which was developed by the United Nations Police (UNPOL). 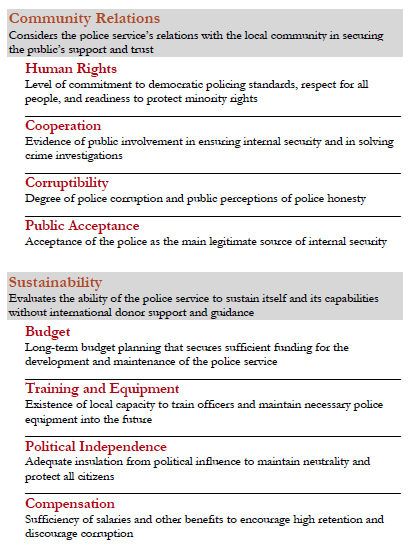 PRIME (Police Reform Indicators and Measurement Evaluation) is a diagnostic tool of 16 core indicators divided into four main pillars of outcomes that is designed to provide UNPOL and the donor community a more comprehensive and systematic way to assess police reform outcomes in post-conflict environments. PRIME can be used to establish a baseline assessment of a police service against which to compare future progress as well as take a snapshot of police performance at a given moment in time. Local police services themselves can use PRIME as an internal accountability and planning mechanism (Bajraktari et al, 2006). Source: Bajraktari et al. 2006. The PRIME System: Measuring the Success of Post-Conflict Police Reform, pgs. 7-8. Set performance standards to monitor the police handling of cases. Implement monitoring processes to measure progress in meeting performance targets. Ensure that individual job descriptions include accountability for upholding the rights of women and girls, with specific references to violence. Monitor public perception of services as a way to ensure that responses are both comprehensive and ethical. 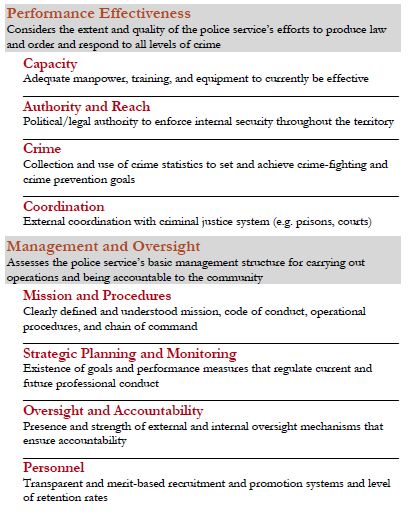 Regular monitoring can also help identify gaps in services and opportunities for increased capacity building (Philippine National Police, 2008). Example: Public perception studies as part of police reform in Kosovo. How many police officers are assigned to the station in your area, and how often do you see them on foot patrol? How often do you encounter a KPS office and what is the nature and quality of the interaction? Do you see the KPS as effective partners, working to help the community? Do KPS officers treat people with respect? How quickly do KPs officers respond when called for in emergencies? Do you feel safer now than you did one year ago? Is crime increasing or decreasing in your municipality? The results of the survey provided an empirical basis for evaluating and reformulating professional development priorities, operations guidelines, and policy planning. The main finding was that a majority of Kosovars “now perceives the police as a trusted and credible institution,” and that the KPS “must further broaden public trust and engage communities through regular dialogue about steps to jointly improve current levels of safety and security. The very process of conducting the survey, done largely by Kosovars, built local expertise in security-sector reform, creating a core of local experts capable of conducting similar initiatives in the future. The survey also promoted widespread awareness of public security issues, prompting constructive discussion and debate in a society not used to such open discourse. Source: excerpted from UNODC and United States Institute of Peace, 2011, p. 80. For more information on methods for improving the sector‘s accountability see Security Module. Gender Self- Assessment Guide for the Police, Armed Forces and Justice Sector (The Geneva Center for the Democratic Control of Armed Forces (DCAF). 2011). A guide designed for use by police services, armed forces and justice sector institutions, and those working with them. The self-assessment guide leads the user through an eight-stage process to conduct an assessment of a security sector institution, create an action plan to move the organisation forward, and monitor and evaluate the plan’s implementation. Available in English. People friendly Police, Karnataka: A police trainer’s guide and resource manual for the initial aspects of gender sensitization (UNICEF. 2003). This manual has been designed with the active participation and suggestions of over 500 Karnataka police personnel, and is intended to be a trainer’s guide and resource manual for the initial aspects of gender sensitiation. Available in English. Performance Standards and Assessment Tool for police Services Addressing Cases of Violence against Women (Philippine National Police (PNP), National Commission on the Role of Filipino Women, and UNFPA. 2008). This tool is also designed to generate data for the monitoring and evaluation of the service provider’s level of compliance to the anti-VAW policies of the Philippine Government. Data generated can also be used as a tool in setting priorities in planning, particularly in the use of the GAD Budget. Available in English.